Quip is one Ben Eyes, a 30-something living on the wrong side of the Pennines in Northern England. 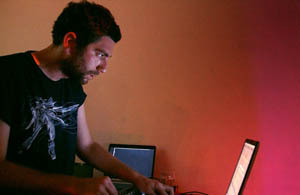 Ben broke his musical hymen making punk, electronic noise and experimenting with sounds before the words "hipster" or god forbid "electro-clash" had been born. With a general sense of what is good and what is not, he has been forging his own musical non-career creating music for raves, documentaries and occasionally teaching the kids how to make a bassline. His musical output is eclectic, from electro-acoustic soundscapes to more brutal beat-based music.